I have a 10-speed mixte my daughter rides, currently has a Velo Orange Tourist handlebar and stem mounted friction shifters. We have been talking about trying bar end friction shifters, but the Tourist is a 22.2 size bar, the openings at the ends aren't big enough for bar ends. I have seen pictures of the Soma Sparrow handlebar, it is also 22.2 but the ends of the grips are bored to 20 mm to accept road stuff like reverse brakes or bar end shifters. I use their portuer bar with barends and cheap interrupter levers. then you have ... the housing , the interrupter brake lever and the rest of the housing in that order..
levers made to be on the end of the cable always pull it straight , not bending it a little every time..
it takes a bar end shifter without boring it out..
Last edited by fietsbob; 03-16-19 at 02:45 PM. its about a 3 degree bend and i have done it on 3 bikes for a while, one over 3 years. I appreciate your concern. Last edited by 52telecaster; 03-16-19 at 06:14 PM. i understand and was suggesting my solution because these levers are quite inexpensive. I have Ergon grips clamped to the outside of that thinned out section on sparrow bars. Mountain style bar ends are notorious for crimping thin bars, I figure it's pretty similar and no issues. Not that it answers the question, but they seem like better than average construction/material. Don't recall if they claim it's heat treated or not. Check out Nitto Albatross bars too. They'll work upright or flipped. No problems with Shimano bar end shifters. I just swapped over the brake levers from my mountain bike flat bars. Nitto offers the albatross in steel and heat treated aluminum. The aluminum is so much lighter than the steel flat and riser bars I had on this bike, I have to be careful taking off from a stop on some uphill intersections -- the bike will wheelie unless I've attached the handlebar bag. It's surprising how much difference the bar made in the bike's front end weight, handling and comfort. More aero and more comfortable, with more hand positions. 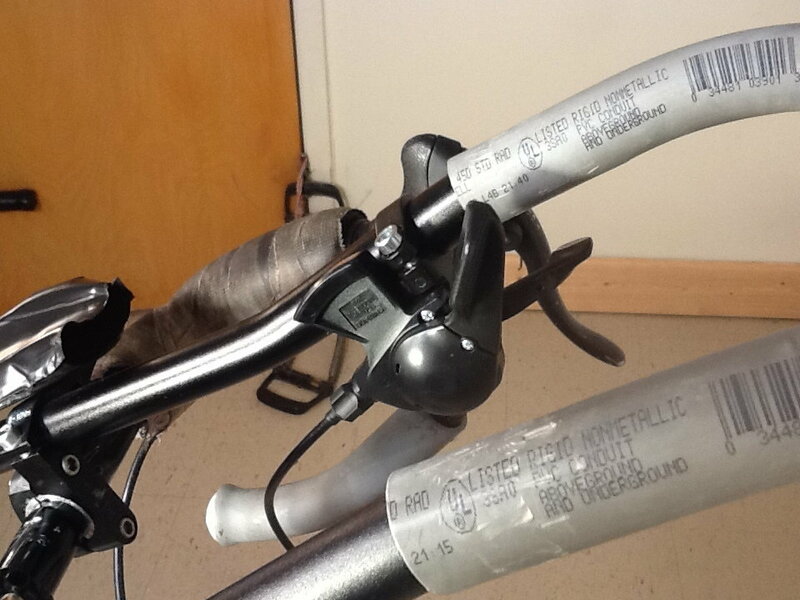 Here's a picture of Soma Sparrow bars with bar-end shifters, courtesy of @simmonsgc. That's a very good vantage point in that picture. The Sparrow appears to have a very nice shape, that North Road kind of geometry that makes the bike comfortable to drive, thanks for putting that up. Dude, why would you want to go through all of that trouble and expense for such a small convenience. Get yourself a Shimano Acera SL-M310 Rapid Fire Index Shifter and shove it up the handle bar as close to the grips as possible. 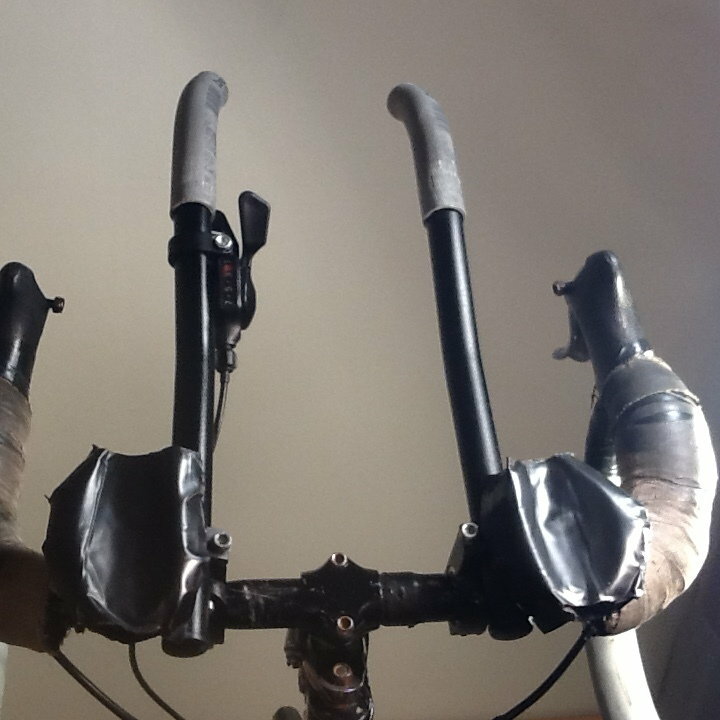 It is just as convenient as bar ends with the same amount of hand movement except it is forward which is safer because part of your hand is always on the bar. And it is all of $17. That at least takes care of the rear Derailler. I do not know if they make one for the Front Derailer but I would not be surprised if they do. My hands are always on the grips when shifting bar end shifters on my hybrid's albatross bar. The trick is to just use the base of the palm to push down, a hooked pinky to lift up. Works great, hands remain in position for handling and braking. The only time I shift my grip is for extreme lifts to get the front into the big ring on the triple, or rear to get into the 32T cog. I hardly ever get into the 50T big ring on the triple, and there are only a couple of hills where I'd need the 32T rear cog, since the front triple has a 30T small ring. Also bar ends just look good on some bike/handlebar combinations, especially swoopy swept back bars. The only thing to watch for is knee clearance. Some folks with cut a bit off the ends of the swept back bars to offset the length of the bar end shifters. It's a tight squeeze on my Univega but the top tube is a bit longer relative to the frame size, and with a slightly longish wheelbase, so I haven't needed to trim the ends of my albatross bar. I might if I switched to narrower swept bars. Thumb and trigger shifters are good. Had 'em, used 'em on other bikes. They still require shifting the hands a bit so we're rarely in the perfect position for shifting and braking without needing to move our hands. But I'm never in a situation when I'd routinely need to shift and brake quickly and often -- I don't race, don't ride singletrack or anything but fairly good gravel roads. I would prefer brifters for fast group road bike rides but I'm accustomed enough to my downtube shifters that I can hold a line while shifting, no risk of making other folks nervous in a paceline. But just because we can do it doesn't make it ideal for that situation. I'd rather always have my hands on the bars. And how much are a set of Bar End Shifters and how much time and/or expense is there to install them? I am unfamiliar with these. Looks interesting, but I see paddles, this uses indexing, correct? (clue: the name of the part) Our bike doesn't have an indexed shift system, friction all the way. Wouldn't we need a index-compatible rear derailer to make this work? Or not? Had a discussion with a guy at work who has a mod I haven't seen, he had a triple in front, removed two rings and the front derailer. Still has the same crank and spider, just one ring with shorter bolts. Prices vary from used bar end shifters for around $20, on up to nearly $100 for some new models. I got a set of the new Shimano bar end shifters for $50 with a generous return policy if I didn't like them or they didn't fit or work on my bike. But I liked 'em on the first ride on my Univega with albatross bars. They're easy to install, no more complicated than the various thumbies, downtube, stem, friction and indexing shifters I've installed. I like 'em all about equally. The bar end shifters just seem right with swept back bars. For a mountain bike with flat or riser bars I'd rather have thumb/trigger shifters. The new Shimanos are index/friction compatible. That option was helpful because my Univega is cobbled together from mismatched donor parts. The bar end shifters index with the original Shimano 7-speed freehub cassette, but not with the replacement wheel's 8-speed MicroShift cassette -- there was just enough difference in spacing to thwart index shifting. No problems, I can switch to a Shimano brand cassette, but meanwhile I'm satisfied with friction shifting. I'm not sure I'd like them as well on drop bars since I'd still need to reach down to shift. I'm already accustomed to downtube shifting and reaching toward the center of the bike doesn't affect balance and handling with practice. I've seen photos of Eddy Merckx and other racers using bar end shifters in competition, but apparently they went back to downtube shifters after experimenting with bar ends. I suspect weight was more of a factor than balance concerns. Any successful racer will have superhuman reflexes and balance anyway. But bar end shifters will weigh more than downtuber -- longer cables and housing runs, and the bar end pods themselves are heavier. For the long climbs on the European grand tour, saving grams matters. 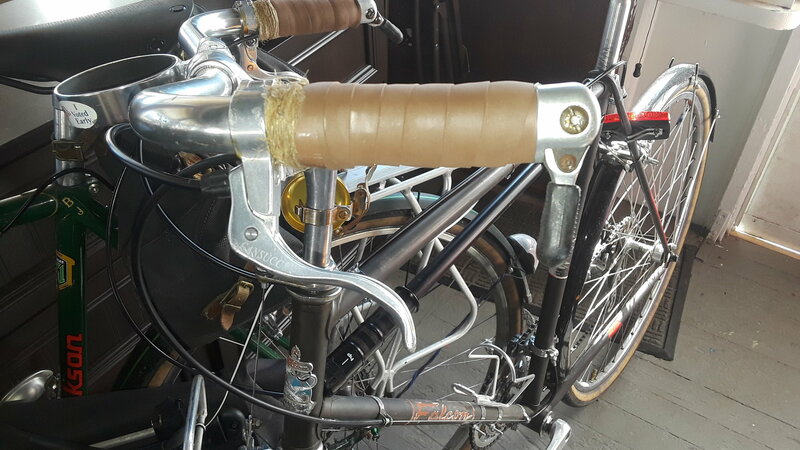 The main concern I have with Bar Ends besides the Instalation problems with different bars and the shifter toggles snagging your leg is that you have one shifter lever to handle both up and down shifts. That has to result in some searching and hesitation. With this two trigger rapid fire shifter you one lever for up shifts and one lever for down shifts. You just stab the lever even unconsciously and it shifts precisely every time. You stab it hard and it shifts two gears. It is clean, precise and effortless. I have this shifter installed up on the left Aero Bar and it works well and is a little cheaper. I think it would work well on swept backs without any of the problems. No problem, happy to help. They are my wife's favorite bar.....bar none! I love thumbshifters. The indexing M732/MT-60 thumbshifters are awesome, as are the Suntour ratcheting Power shifter thumb shifters. 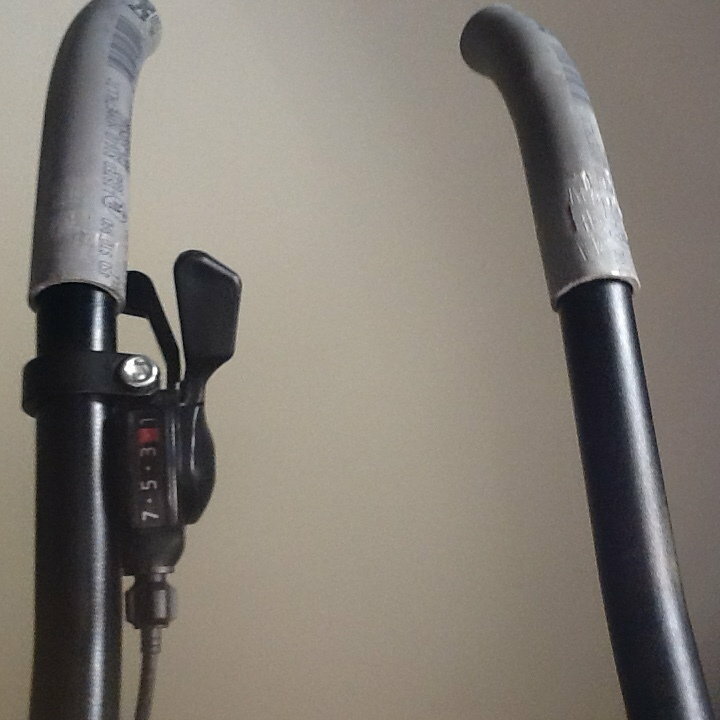 I need to host some better pix of my High Sierra with the trekking bars- it’s just not “done” yet.